In an album called Strictly Roots, what would you expect? Strictly Roots, maybe? If you do, you'll be surprised. 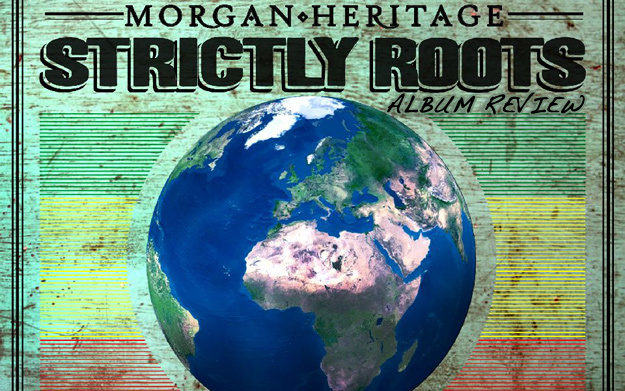 The tenth release of the Morgan Heritage family Peetah (vocals), Una (keyboard/vocals), Gramps (keyboard/vocals), Lukes (rhythm guitar) and Mojo (percussion/vocals) is not, as the title implies, a homage to Roots Reggae music, but a potpourri (or rather "pop-pourri") of different styles, clearly aimed at a mainstream audience. It is at the same time the first release on their very own label C.T.B.C. (Cool To Be Conscious) Music Group, marking the emancipation from their long lasting collaboration with VP Records. Co-produced by greats such as Don Chandler, Seani B, Shane C. Brown, Jason "J-Vibe" Farmer, Matthieu Bost, Jérémie "Bim" Dessus and DJ Frass, and enhanced by guitarist Andrew "Simmo" Simpson and drummer Gil Sharone, the 13 tracks included (14 if you get the iTunes-Bonus Keep On Jammin' featuring Shaggy) guarantee a wide variety of sounds, but at the same time the coherent album-feeling so present in, say, Ancient Future is lost somehow. By far the strongest track on the album is the Chronixx-feature Child Of Jah. Conscious lyrics and this head-nodding, foot-skanking Roots-Reggae-feeling make it a great listening experience. Likewise, it is these qualities that Morgan Heritage recollects in title track Strictly Roots and the beautiful Rise And Fall, which instantly brings to mind past hits like Down By The River. Playing in this league is also Wanna Be Loved featuring Eric Rachmany (Rebelution), one of the few songs that brings across that "authentic Morgan Heritage organic roots sound" mentioned by the accompanying press release. Other features worth mentioning are Jo Mersa Marley in Light It Up (if you like Dubstep, that is), We Are Warriors with SOJA-member Bobby Lee and the poppy So Amazing featuring Jemere Morgan and J Boog. "Poppy" is what describes Sunday Morning and Celebrate Life sufficiently as well, and even though it might win them new fans outside of the Reggae family, they won't last on my player. Why Dem Come Around, Put It On Me and Perform And Done, which is already out on video, round off the package and are comparatively easy listening. With this release, Morgan Heritage is clearly on a mission to win over new audiences, a task that will doubtlessly be achieved by the accompanying tour which is in full swing. It is not, however, the Strictly Roots experience long-standing fans might have expected. Why they still chose this title is explained by Mojo Morgan: "This album is our most progressive album to date. We feel as if we've covered the full spectrum of Jamaican music and how it has influenced today's global music industry. The root of these influences you hear come from Jamaica. Hence the title Strictly Roots."